The loss of two of three games in soggy Detroit paled compared to the injury to Robinson Cano, who broke a bone in his right hand after being struck by pitch. James Paxton, in his first game following his no-hitter, returned to earth with a solid but unspectacular six innings in which he gave up three runs. But reliever Juan Nicasio again couldn’t stay out of trouble in the the ninth inning, giving up three hits, including a walk-off single to Jose Iglesias in a 5-4 loss (box). The Mariners were two of 13 with runners in scoring position. 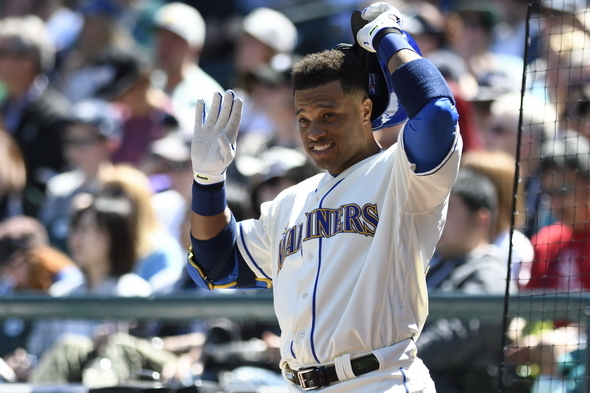 Mariners manager Scott Servais had no immediate timeline for Cano’s injury, but broken bones typically take four to six weeks at minimum, and hands can be longer. Cano told reporters post-game that he will fly to Philadelphia to see a hand specialist and that surgery is possible. Cano is hitting.287 with an .826 OPS, four homers and 23 RBIs. In the third inning, Cano couldn’t pull back fast enough from starter Blaine Hardy’s 88 mph inside fastball. That remains to be seen, as the Mariners (22-17) have sputtered at times offensively, needing just a big hit there and there that would have provided a three-game sweep of the Tigers (17-22), who have lost to injury their best player, Miguel Cabrera. Instead, the Mariners lost two one-run games. In a weather-forced doubleheader Saturday, they lost the opener 4-3 despite having the bases loaded in the ninth, before winning the nightcap 9-5. Answering a question, Servais dismissed the idea of moving Dee Gordon from centerfield to second base, where he played most of his career and was an All-Star for the Marlins. But his transition to the outfield has gone well enough that the Mariners want to keep him there. At AAA Tacoma, utility man Taylor Motter is an obvious choice to fill in quickly for Cano, who was replaced Sunday by Andrew Romine, who had a hit Sunday but is hitting .185. But Motter is hitting .198. Gordon Beckham, 31, with more than 900 games with five major league teams, including 11 with Seattle at the end of last season, is hitting over .300 with Tacoma and may get the call. Regarding Paxton, Servais said his ace fell in love with his fastball a little too much. The Mariners play a makeup game at Minnesota at 4:10 p.m. Monday before returning home for a six-game stand at 7:10 p.m. Tuesday with the first of two against Texas. The top five teams in low ERA are the five that would go to the playoffs if the season ended today. Paxton and Diaz are the two they cannot afford to lose for any period this year.